If you are having troubles signing in to Method with your Google account, you may need to re-authenticate by following these steps. Make sure you are signed into Google. Navigate to https://security.google.com/settings/security/permissions to see Apps connected to your Gmail account. Click Method:CRM on the list and click the Remove button. In your browser, go to https://signin.method.me. Click Sign in with Google. 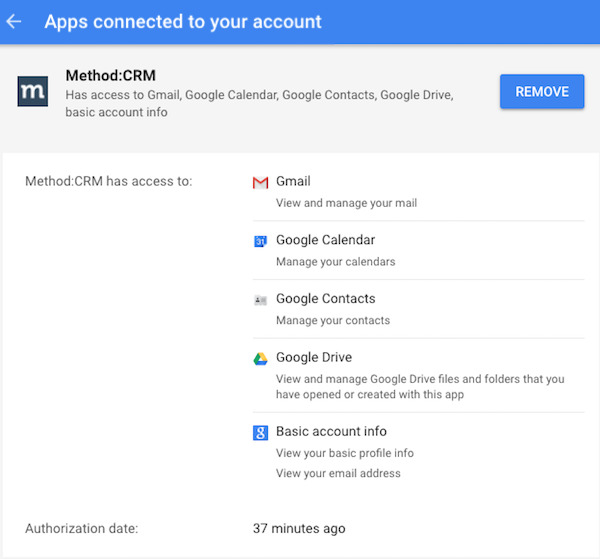 You'll receive a Google permission screen asking to give permission for Method:CRM to access your Google account. Select Authorize. Type in your Method email and password on the Link Your Account page and sign in.